Clearly I do not do well with posed pictures. This was the best of quite a few, unfortunately! 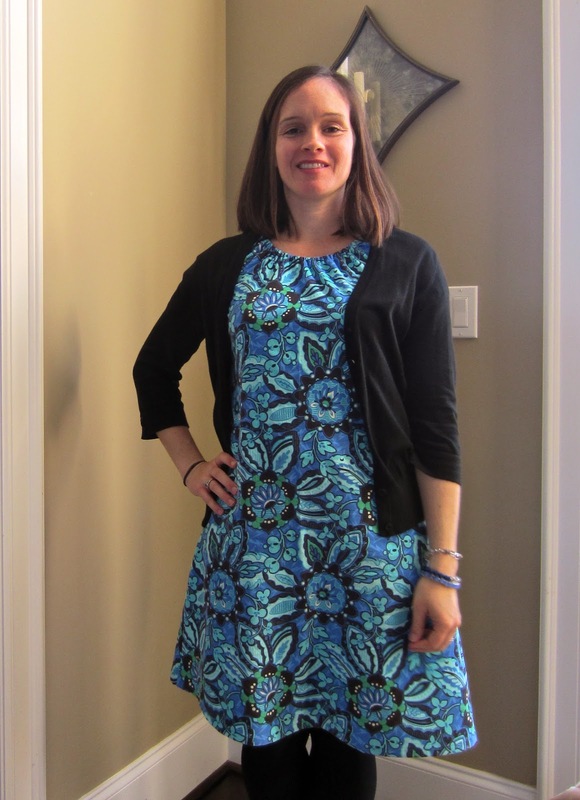 Self timer shots are just not easy, but I wanted to share my newest dress from the Built By Wendy Simplicity 3835. This pattern has gotten a lot of use for me here, here & here. Sadly, this is out of print, but I think it can still be found on etsy and ebay. It's so easy and comes together fast, plus you can switch it up a bit with a different neckline, pockets, tunic, ties on the sleeves, all in the pattern. I made it from Amy Butler's Trailing Orchid Corduroy in Blue Velvet. I really need to figure out how to stand when I pose & what to do with my arms. If anyone know, please share! Oh, and I got my hair cut this morning. Went in for a trim, came out with a 10" ponytail for Locks for Love. Did not realize quite how long it had gotten. I guess that happens when you wear a ponytail every day! Both your new hair cut and your dress are so pretty Courtney. I am soooo impressed that you can sew clothing! Courtney....beautiful dress, beautiful sewing room and that quilt that you want to scrap...that is not a good idea...it is lovely.